A reader has made a plea for urgent action to stop the deterioration of the historic Wignacourt Fountain. 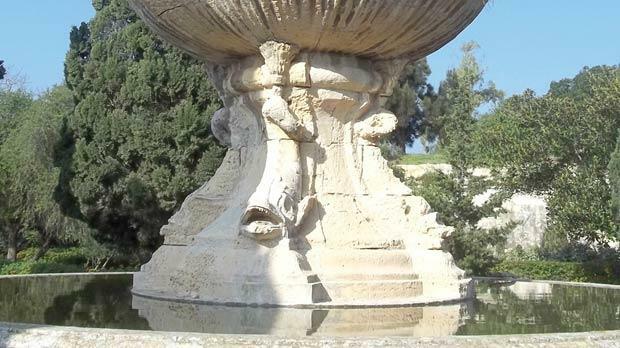 "While the Malta Environment and Planning Authority had scheduled the Wignacourt fountain as a Grade 1 national monument in 2008, it has been neglected and left in a pitiful state," Joe Morana said in a letter in The Times. He also shot the footage shown below. The fountain, at St Philip’s Garden in Floriana, was originally located on Palace Square, Valletta. It was the first fountain erected after the building of the Wignacourt aqueduct. It was inaugurated during Eastertide, on April 21, 1615. It was moved by the British military to St Philip’s Garden so the Palace square could be used for military parades. The Wignacourt fountain features a large circular basin with three superimposed seashells, like shaped basins, each one smaller than the one below it, supported on a cone-shaped pedestal with four dolphins with upturned tails or rather what is still left of them.